· Intraventricular conduction system: The intraventricular conduction system includes the bundle of His, the right and left bundle branches, the fascicular branches of the left bundle branch, and the distal Purkinje fibers (Fig. 9.1). o Bundle of His: The bundle of His is a continuation of the atrioventricular node. It is a short structure that immediately divides into two branches: the right and left bundle branches. o Right bundle: The right bundle branch follows the right side of the ventricular septum and terminates into a network of Purkinje fibers within the endocardium of the right ventricle. o Left bundle: The left bundle branch immediately fans into several branches, including a mid-septal branch and two main fascicles: the left anterior and left posterior fascicles. § Left anterior fascicle: The left anterior fascicle courses to the base of the anterior papillary muscle before terminating into a network of Purkinje fibers. § Left posterior fascicle: The left posterior fascicle terminates into a network of Purkinje fibers after reaching the base of the posteromedial papillary muscle. · Although the atria and ventricles are contiguous structures, the only pathway by which the sinus impulse can reach the ventricles is through the atrioventricular node. After exiting the atrioventricular node, conduction of the impulse through the intraventricular conduction system results in a fast and orderly sequence of ventricular activation. However, the sinus impulse can be pathologically delayed or interrupted anywhere within the intraventricular conduction system (Fig. 9.2). o Bundle branch block: If the sinus impulse is interrupted within the bundle branches, the abnormality is called bundle branch block. § Right bundle branch block: If the impulse is interrupted within the right bundle branch, the conduction abnormality is called right bundle branch block. § Left bundle branch block: If the sinus impulse is interrupted within the left bundle branch, the conduction abnormality is called left bundle branch block. o Fascicular block: If the sinus impulse is interrupted within the fascicles, the conduction abnormality is called fascicular block. § Left anterior fascicular block: If the sinus impulse is interrupted within the left anterior fascicle, the conduction abnormality is called left anterior fascicular block (LAFB). § Left posterior fascicular block: If the sinus impulse is interrupted within the left posterior fascicle, the conduction abnormality is called left posterior fascicular block (LPFB). Figure 9.1: The Intraventricular Conduction System. The intraventricular conduction system consists of the bundle of His, right and left bundle branches, the fascicular branches of the left bundle branch, and the Purkinje fibers. Figure 9.2: Diagrammatic Representation of the Atrioventricular Node and Intraventricular Conduction System. The sinus impulse can propagate to the ventricles only through the atrioventricular node and intraventricular conduction system, resulting in orderly sequence of ventricular activation. The sinus impulse can be blocked anywhere along this conduction pathway, resulting in different types of intraventricular conduction defect. Figure 9.3: Left Anterior Fascicular Block. The hallmark of LAFB is the presence of left axis deviation >-30° with rS complexes in leads II, III, and aVF and tall R waves in leads I and aVL. Briefly, LAFB should always be suspected when there is negative or rS complex in lead II with a tall R wave in lead I (the essential leads are framed). · Left anterior fascicular block: LAFB occurs when the sinus impulse is delayed or interrupted within the left anterior fascicle. LAFB is the most common intraventricular conduction abnormality because the left anterior fascicle is a long and thin structure that is more delicate and more vulnerable to injury than the rest of the conduction system. · Electrocardiogram findings: LAFB alters the electrocardiogram (ECG) by abnormally shifting the axis of the QRS complex to the left of -30°. 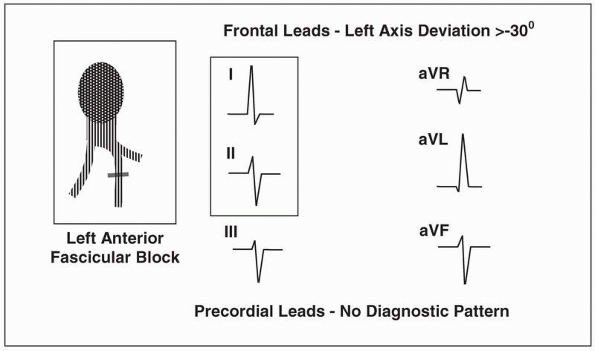 The most important leads in detecting the abnormal left axis deviation are leads II and aVL. o Lead II: This is the most important lead in suspecting that LAFB is present. In lead II, the QRS complex is negative with an rS configuration (r wave is smaller than the S wave). Leads III and aVF will also show an rS pattern. o Lead aVL: A tall R wave in lead I (Rs complex) and a qR pattern in aVL will confirm that the axis has shifted to the left. · In LAFB, the right ventricle continues to be supplied by the right bundle branch, and the left ventricle continues to be supplied by the left posterior fascicle. Therefore, activation of both ventricles remains synchronous and the duration of the QRS complex is not increased. It normally remains at 0.08 to 0.10 seconds. · The ECG findings of LAFB are shown in Figures 9.3 and 9.4.
o LAFB mistaken for anterior infarct: LAFB may cause small q waves in V2 and in V3, which can be mistaken for anteroseptal infarct (Fig. 9.5). These micro-q waves may become more exaggerated if V1 and V2 are inadvertently positioned at a higher location on the patient's chest (at the 2nd rather than the 4th intercostal space). o LAFB mistaken for inferior infarct: LAFB may be confused with inferior myocardial infarction (MI) because both can shift the QRS axis to the left of -30°.However, inferior MI will show initial q waves in leads II, III, and aVF (Fig. 9.6), whereas the QRS complex in LAFB start with a small r wave in II, III, and aVF (Fig. 9.5). · LAFB and inferior MI: LAFB and inferior MI may be difficult to recognize when they occur together unless the leads are recorded simultaneously (Fig. 9.7A). o LAFB: For LAFB to be present, (1) the axis of the QRS complex should exceed -30°, (2) both aVR and aVL should end with R waves, and (3) the peak of the R wave in aVL should occur earlier than the peak of the R wave in aVR (Fig. 9.7B). o LAFB + inferior MI:When LAFB is associated with inferior MI, a q wave in lead II should be present (Fig. 9.8A) in addition to criteria 1, 2, and 3 for LAFB listed previously (Fig. 9.8B). o Left axis deviation >-30° (rS complexes in II, III, and aVF and qR in I and aVL). · The horizontal or precordial leads are not needed for the diagnosis of LAFB. Figure 9.4: Left Anterior Fascicular Block. Twelve-lead electrocardiogram showing left anterior fascicular block (LAFB). The axis of the QRS complex is -60°. LAFB should always be suspected when a tall R wave is present in lead I and deep S wave is present in lead II (the leads are framed). The QRS complexes remain normal in duration. The precordial leads are not helpful in establishing the diagnosis, although poor R wave progression is usually present. The changes in the precordial leads are due to extreme deviation of the electrical axis superiorly. These changes may disappear if the leads are positioned two intercostal spaces higher than the standard location. · The left anterior fascicle activates the anterior and superior portions of the left ventricle. When there is LAFB, the area supplied by the left anterior fascicle is the last to be activated. This causes the axis of the QRS complex to shift superiorly and to the left. The hallmark of LAFB is a shift in the QRS axis to the left of -30°. Although an axis of ≥-45° is the traditional criteria used in the diagnosis of LAFB, a QRS axis >-30° is accepted as LAFB. · The QRS complex is not widened when there is LAFB because the left ventricle has two overlapping sets of Purkinje fibers: one from the left anterior fascicle and the other from the left posterior fascicle. When there is LAFB, the left ventricle is activated by the left posterior fascicle and the right ventricle by the right bundle branch, thus both ventricles remain synchronously activated. If there is any increased duration of the QRS complex, it will be minimal and should not exceed 0.01 to 0.02 seconds above baseline. Thus, the total duration of the QRS complex will remain within 0.10 seconds unless there is MI or left ventricular hypertrophy. · In LAFB, the left ventricle is initially activated by the left posterior fascicle. Thus, the initial QRS vector is directed inferiorly and to the right, often causing q waves in V2 and V3. This becomes exaggerated if the electrodes are positioned higher on the chest or if the heart is oriented vertically. Figure 9.5: Left Anterior Fascicular Block. Left anterior fascicular block can cause small q waves in V2 and V3, which can be mistaken for anterior myocardial infarction. These micro-q waves become more pronounced if leads V1 to V3 are placed higher than the standard location and the patient is in a sitting position when the electrocardiogram is recorded. Figure 9.6: Inferior Myocardial Infarction. Left anterior fascicular block should not be confused with inferior myocardial infarction (MI). In inferior MI, leads II, III, and aVF start with a q wave as shown here, rather than with a small r.
Figure 9.7: Left Anterior Fascicular Block. When leads aVR and aVL are simultaneously recorded (A), left anterior fascicular block is present when there is left axis deviation >-30° and aVR and aVL both terminate with an R wave. (B) Magnified to show that the peak of the R wave in aVL occurs earlier than the peak of the R wave in aVR. Figure 9.8: Left Anterior Fascicular Block with Inferior MI. (A) Leads aVR and aVL are recorded simultaneously and are magnified in(B). Note that the terminal R wave in aVR (arrow) occurs later than the terminal R wave in aVL, consistent with left anterior fascicular block. In addition, q waves (QS) are present in lead II (A), consistent with inferior myocardial infarction. Figure 9.9: Left Posterior Fascicular Block. The most important feature of left posterior fascicular block (LPFB) is the presence of right axis deviation >90°. The diagnosis should be considered only after chronic obstructive pulmonary disease and other causes of right ventricular hypertrophy are excluded. The presence of LPFB is suspected when deep S wave is present in lead I (rS complex) and tall R wave (Rs complex) is present in lead II (the leads are framed). · The left anterior fascicle is a long and thin structure that terminates into a network of Purkinje fibers at the base of the anterior papillary muscle. It courses subendocardially in the direction of the outflow tract of the left ventricle, and thus is subject to higher intraventricular pressure than the rest of the conduction system. Because of its structure and location, LAFB is the most common intraventricular conduction abnormality. · LAFB is a common cause of left axis deviation and should be considered immediately when left axis deviation exceeds -30°. LAFB may be difficult to recognize when combined with inferior MI because both can cause left axis deviation. o LAFB: In LAFB, the QRS axis is >-30° and leads II, III, and aVF start with small r waves. The terminal QRS vector loop in the frontal plane is directed superiorly and leftward in a counterclockwise direction. Thus, the peak of the R in aVL occurs earlier than the peak of the R in aVR. o Inferior MI: In inferior MI, leads II, III, and aVF start with q waves. o LAFB and inferior MI: There is LAFB if the QRS axis is >-30°, terminal R waves are present in aVR and aVL and the peak of the R wave in aVL occurs earlier than the peak of the R wave in aVR. If any q wave is present in lead II, inferior MI is also present. · LAFB is commonly the result of hypertension, ischemic heart disease, cardiomyopathy, aortic valve disease, and sclerosis or fibrosis of the conduction system. Left ventricular hypertrophy is commonly associated with LAFB. Conversely, LAFB can augment the tall R waves in aVL, which can mimic left ventricular hypertrophy. In children, left axis deviation of ≥-30° is abnormal and is usually due to primum atrial septal defect. Figure 9.10: Normal Electrocardiogram. The QRS complexes are not widened, with normal axis of approximately 75°. Figure 9.11: Left Posterior Fascicular Block. Twelve-lead electrocardiogram showing left posterior fascicular block (LPFB). The QRS complexes are not widened and the axis is shifted to + 120°. Before LPFB is diagnosed, other causes of right axis deviation should first be excluded. · LAFB does not require any treatment. Therapy is directed to the underlying cause of the LAFB. · The prognosis of LAFB depends on the underlying cause. If this is the only conduction abnormality and no associated cardiac disease is present, LAFB is generally benign. · Left posterior fascicular block: LPFB occurs when conduction across the left posterior fascicle is delayed or interrupted. It is the least common among all intraventricular conduction abnormalities. · ECG Findings: The hallmark of LPFB is a shift in the electrical axis of the QRS complex to the right of 90° (Fig. 9.9). Because LPFB is uncommon, other more common causes of right axis deviation should first be excluded before LPFB is diagnosed. 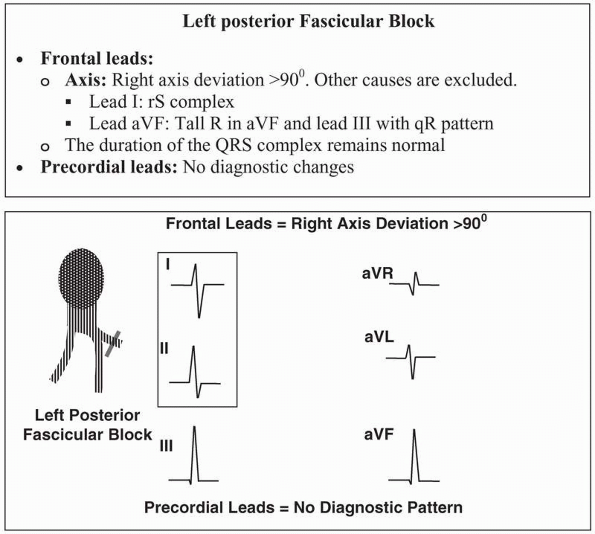 The QRS complexes are not widened because the left ventricle continues to be activated by the left anterior fascicle. A normal ECG is shown in Fig. 9.10. For comparison, the ECG of LPFB is shown in Fig. 9.11.
o Right ventricular hypertrophy mistaken for LPFB: LPFB is relatively uncommon and is considered a diagnosis of exclusion. Other causes of right axis deviation, such as right ventricular hypertrophy or pulmonary disease, should first be excluded before the diagnosis of LPFB is considered (Figs. 9.12 and 9.13). This contrasts with LAFB, where the diagnosis is considered immediately when the axis is >-30°. o Lateral MI mistaken for LPFB: High lateral MI can cause right axis deviation >90° and can be mistaken for LPFB. In LPFB, rS complexes are present in I and aVL (Fig. 9.11). In lateral MI, QS complexes are present in these leads (Fig. 9.14). o Right axis deviation >90° with negative or rS complex in I and aVL and qR in III and aVF. o The QRS complexes are not widened. o Other causes of right axis deviation have been excluded. o The precordial leads are not necessary in the diagnosis of LPFB. Figure 9.12: Right Ventricular Hypertrophy. The frontal leads show all features of left posterior fascicular block (LPFB). However, tall R waves are present in V1, suggesting right ventricular hypertrophy and not LPFB. Figure 9.13: Right Ventricular Hypertrophy. There is right atrial enlargement with peaked P waves in leads II, III, and aVF (arrows). There is clockwise rotation of the QRS complexes in the precordial leads. This electrocardiogram is consistent with right ventricular hypertrophy and not left posterior fascicular block. Figure 9.14: Lateral Myocardial Infarction. Lateral myocardial infarction (MI) with QS complexes in I and aVL can be mistaken for left posterior fascicular block (LPFB) as shown here. In LPFB, leads I and aVL have rS complexes, whereas in lateral MI, these leads start with q waves. Q waves are also present in V1 to V4 because of anterior MI. · The left posterior fascicle activates the posteroinferior left ventricular free wall, which is to the right and inferior to that activated by the left anterior fascicle. This portion of the left ventricle is the last to be activated when there is LPFB, thus causing the axis of the QRS complex to shift inferiorly and to the right. While a QRS axis ≥100° is traditionally used to identify LPFB, a QRS axis >90° is generally accepted as LPFB. The QRS complex is not widened when there is LPFB because the left ventricle continues to be activated by the left anterior fascicle and the right ventricle by the right bundle branch, resulting in synchronous activation of both ventricles. · LPFB is a diagnosis of exclusion since LPFB is relatively uncommon. This contrasts with LAFB, in which the diagnosis is considered outright when there is left axis deviation >-30°. Before the diagnosis of LPFB is considered, other, more common, causes of right axis deviation such as pulmonary disease and other causes of right ventricular hypertrophy should first be excluded. · In contrast to the left anterior fascicle, the left posterior fascicle has a dual blood supply, originating from the septal perforating branches of the left anterior descending coronary artery anteriorly and from the septal perforating branches of the posterior descending artery posteriorly. It is short, thick, and broad and courses along the inflow tract of the left ventricle before terminating into a network of Purkinje fibers at the base of the posteromedial papillary muscle. It is therefore protected and subjected to less intraventricular pressure compared with the left anterior fascicle. Because of its structure, location, and blood supply, LPFB is the least common among all intraventricular conduction abnormalities. · The most important lead in recognizing LPFB is lead I. This will show a negative or rS complex, with the S wave deeper than the size of the r wave. This is accompanied by tall R waves in leads aVF and III. · Right axis deviation due to high lateral MI can be mistaken for LPFB. Correspondingly, LPFB can obscure the ECG changes of inferior MI. · The causes of LPFB are the same as that of LAFB and include coronary disease, hypertension, cardiomyopathy, acute myocarditis, valvular disease (especially aortic stenosis), and degenerative diseases of the conduction system. · Treatment is directed toward the underlying cause of the LPFB. · Because the left posterior fascicle is the least vulnerable and the last to be involved when there is intraventricular conduction defect, LPFB seldom occurs independently and is frequently seen in combination with right bundle branch block or with LAFB. LPFB, therefore, indicates a more significant and more advanced form of conduction abnormality than LAFB. LPFB in combination with LAFB can result in left bundle branch block. The prognosis depends on the cause of the conduction abnormality. Dunn MI, Lipman BS. Abnormalities of ventricular conduction: fascicular block, infarction block, and parietal block. In: Lippman-Massie Clinical Electrocardiography. 8th ed. Chicago: Yearbook Medical Publishers, Inc.; 1989:148-159. Elizari MV, Acunzo RS, Ferreiro M. Hemiblocks revisited. Circulation. 2007;115:1154-1163. Marriott HJL. The hemiblocks and trifascicular block. In: Practical Electrocardiography. 5th ed. Baltimore: The Williams and Wilkins Company; 1972:86-94. Sgarbossa EB, Wagner GS. Electrocardiography: In: Topol EJ, ed. Textbook of Cardiovascular Medicine. 2nd ed. Philadelphia: Lippincott Williams & Wilkins; 2002:1330-1354. Warner RA, Hill NE, Mookherjee S, et al. Electrocardiographic criteria for the diagnosis of combined inferior MI and left anterior hemiblock. Am J Cardiol. 1983;51:718-722. Warner RA, Hill NE, Mookherjee S, et al. Improved electrocardiographic criteria for the diagnosis of left anterior hemiblock. Am J Cardiol. 1983;51:723-726. Willems JL, Robles de Medina EO, Bernard R, et al. Criteria for intraventricular conduction disturbances and pre-excitation. J Am Coll Cardiol. 1985;5:1261-1275.